Charles “Daddy” Townsend (DeLeon) is an ultra-rich businessman so he decides to assemble a team of people with various strengths, and pay them each a lot of money to rescue his missing son. The island they’re all located on was the site of “one of the bloodiest massacres of World War II” back in 1945. It was then that a Japanese soldier and an American soldier vowed revenge on each other. Steve Ryker (Douglas) is the trustworthy Chicago cop, Norman McKloskey and Linda Blomberg (Hayward and Killion, respectively) are journalists meant to make a record of the events, and those are just some of the characters who get thrown into this situation - and then things go haywire. Will anyone escape the island alive? Will they escape the VIOLENT ZONE? We expected Violent Zone to be an 80’s Vietnam slog, but it’s not. It’s still a jungle/mercenary slog, but it doesn’t have much to do with ‘Nam, except for the fact that some of the mercs are ‘Nam vets. It doesn’t factor into the plot too much. But it doesn’t really matter, as the “assemble a team” movie was done much better in past years, the most shining example being Kill Squad (1982). We should have been wary about the name John Garwood, because we weren’t exactly fans of A Taste of Hell (1973), but we decided to give him another chance. Well...despite a couple of decent moments (we really enjoyed the guy who looked like David Crosby, but we don’t know his name) Violent Zone is a dud. It’s not very engaging, and its level of dumbness was just too high. A lot of times dumb can be good, but here, without too many other redeeming factors, it’s not. We also wanted to see Chard again after The Killing Game (1988), and he puts in one of the best performances here. Coincidentally (?) enough, Cynthia Killion was also in The Killing Game. Naturally, Townsend, as the mastermind who assembles the team, only selects these people because “they’re the best”, a time-honored cliche we all know and love. It was interesting that the main hero, Steve Ryker, was played not by some young punk, but by a middle-aged man who looks like Ned Beatty. Douglas, the guy who played him, never did any other movies. Perhaps he felt Violent Zone could never be topped. Nevertheless, he does have a T-shirt that says “Have You Hugged A Bad Guy Today?”, so maybe he was hired for his big heart. 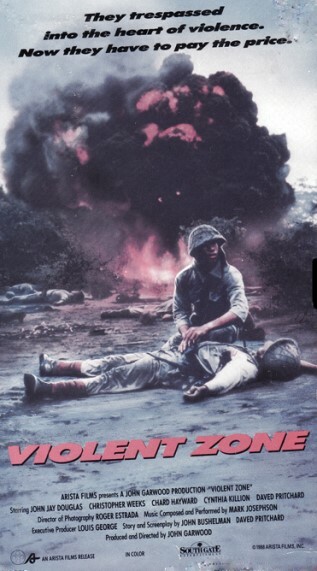 Whether for good or for bad, Violent Zone is just another movie shot in the Philippines that came out in 1989. Plotwise, it loses a lot of steam towards the middle and doesn’t really recover it. Because 1989 was a golden year for VHS product in video stores, it did receive a VHS release. But the DVD is one of those one dollar jobs without even a menu. 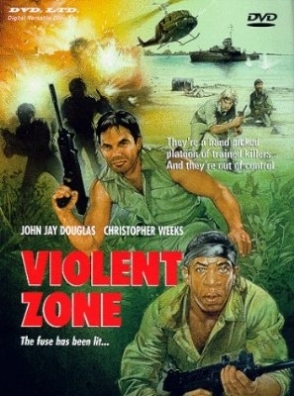 Despite its eye-catching title, Violent Zone is really for only the most die-hard completists of the jungle slog genre. I thought this was a pretty fun ride overall, I love just about anything set in the Phillipines. Most Philippines set movie are pretty fun...especially the early 70s-80s Roger Corman flicks.